Are you passionate about your citrus, and looking to expand your customer base? Become a Sunkist® grower and join our cooperative of other family farmers. For over 120 years, the Sunkist cooperative has empowered individual farmers to do what they couldn’t alone. This includes developing a worldwide market, promoting and developing a brand, accessing a global transportation system, developing comprehensive research capabilities, and gaining governmental access to overseas markets. You’ll also receive access to our full growers website which includes farming resources and a subscription to our newsletter. Our packinghouses are conveniently located throughout California and Arizona’s farming valleys, ensuring quick and easy access to our growers. Find the packinghouse nearest your farm. 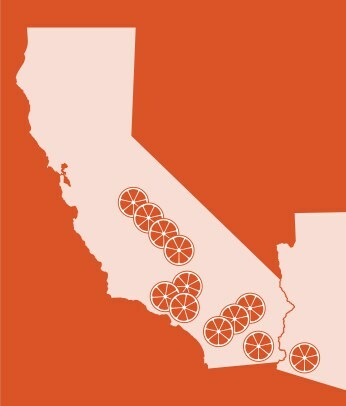 Sunkist growers have deep roots in citrus. Generations of farmers were raised in the orchards where their parents (and grandparents) grew citrus, each generation passing down their knowledge to the next. Meet some of these families in our Sunkist Family Stories video series. Sunkist Growers may sign up for the Growers website to receive access to industry resources and more. Fields with an asterisk (*) must be completed to submit your request. YES, sign me up to recieve the Sunkist Growers news.